Uwe Rosler says nobody at Fleetwood Town, including himself, wants relegation on their CV as Town bid to climb away from danger. Town head to Doncaster Rovers on Saturday knowing a win will see them climb level on points with Rovers. Fleetwood slipped two points closer to the drop zone after suffering their sixth straight defeat, losing 2-1 to Shrewsbury on Tuesday night. And now Rosler says this is something new to him but he is determined to succeed. 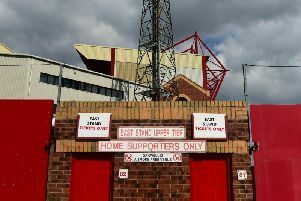 To do that though he says Fleetwood need their best players on the pitch and Town will be boosted by the return of centre-half Cian Bolger from suspension though striker Paddy Madden and midfielder George Glendon are both doubts. He said: “I’ve never been at the bottom of the table in that manner. It is something new for me but that is why I’m here. “The thing is that there is more football in that team. To get out of this we need our best players on the pitch.